Thanks in great part to its new deal with Mozilla, Yahoo has accomplished what many thought impossible – growing its U.S. search share. Yahoo! 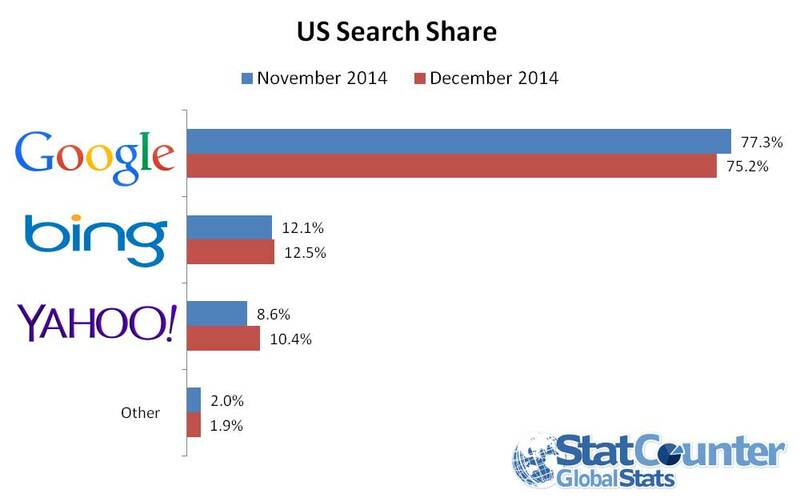 grew its search share in the U.S. from 8.6 percent in November 2014 to 10.4 percent in December. Bing inched up (from 12.1 to 12.5 percent). What is most astonishing however is that Google fell to the lowest monthly share ever recorded by StatCounter, the provider of the monthly report (which is based on 15 billion page views), as illustrated in the chart below. Thanks in great part to the deal with Mozilla, Yahoo has accomplished what many thought impossible. While both Bing and Yahoo have a long way to go to knock off the Web’s leading search engine, it certainly shows that the potential for Google to lose its digital bread and butter is possible. “The move by Mozilla has had a definite impact on US search,” commented Aodhan Cullen, CEO, StatCounter. “The question now is whether Firefox users switch back to Google.” Firefox users represented just over 12% of US internet usage in December according to StatCounter.